If there is one thing that Oxford University Press can produce better than any other publisher, it’s a dictionary. 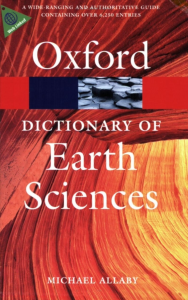 This is the third edition of The Oxford Dictionary of Earth Sciences, published in March 2008 and edited by Michael Allaby. More than 6,250 terms have been updated for this new edition with numerous additional entries contributed by the advances in planetary science, and there are more than 130 diagrams describing forms and processes. It covers an extremely broad range of topics, sweeping from the movement of atoms within minerals to fossilization processes to cosmic dust. When searching for specific topics such as ‘astrobiology’, the reader should first search for ‘exobiology’, as the term ‘astrobiology’ does not occur. Topics discussed include extremophilic micro-organisms, biomarkers, meteorites and their elemental and mineralogical compositions, Mars, its surface features and space missions and a revised terrestrial geological time scale as well as lunar and Martian time scales. An excellent new feature is the appendix of recommended web links, which is updated on the Dictionary of Earth Sciences companion website. These are in the most part addresses for Geological Societies around the world, with none on specific aspects of Earth Sciences. This dictionary would be an important supplement to any Earth Science course or related discipline, but is also written so that someone without prior knowledge can be easily introduced to the field. The author makes it clear in the preface that this book is intended as a dictionary of words and terms in current use, and an explanation of them is provided without personal opinion or bias. This has led to the production of a concise, informative and attractive book that attempts to cover every aspect of Earth Sciences for the modern world.